It's sometimes hard to believe the similarities between real-life events and music. You could say that when you are late or early in life, you are not in sync with your environment. Well it's similar in music: when something is delayed or comes early (as you will see in the next article), there's often dissonance. That's why you need to be well prepared! In article 23 I mentioned the alternation between consonance and dissonance. The harmonic suspension effect illustrates this phenomenon very well. 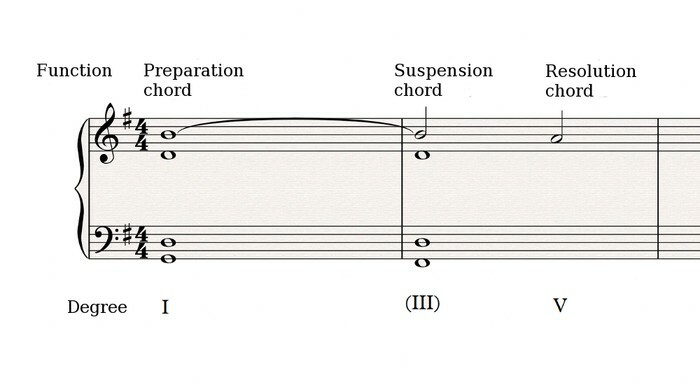 Because the suspension is created with a sequence of three chords: the preparatory chord (consonant), the suspension chord (dissonant) and the resolution chord (consonant again) The function of each of these chords is defined by a very precise note. In this regard, I recommend you to take a look at the definition of chord tones and non-chord tones in article 8, it might come in very useful! But let's go back to our three chords. In the first one you have the so-called "preparatory" note, which is a chord tone of the chord in question. In the third one you have the "resolution" note, which is again a chord tone. The latter resolves the dissonance created by the suspension note of the second chord, which is a non-chord tone. And now is when I reveal the secret behind harmonic suspension: the suspension note of the second chord is none other than the preparatory note of the preceding chord. Both chords include the same note and you could actually say that the function of the preparation and suspension chords is defined by the continuation of the same note which creates the dissonance and is resolved in the third chord. You'll see in a minute how this translates in practice. In the following example, you have the G major, B minor and D major chords. The harmonic resolution is achieved by moving the B of the second chord to the A of the third one. And that same B of the second chord is held over from the first chord. The latter is the preparation chord, B minor the suspension chord and D major the resolution chord. But in this example you can see that the suspension doesn't create a dissonance strictly speaking, since the B note is not non-chord tone of the suspension chord. Its actually due to the resolution chord (the V chord, D major) that you can understand the suspension function of the second chord. However, as a general rule, you should avoid having both the suspension note and the resolution note sounding at the same time, like in this case (the E is already part of the suspension chord, which accentuates the dissonance). You should pay special attention to conjunct suspensions, too. 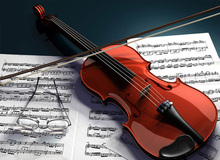 The concept of harmonic suspension is deeply linked to the rhythm of a song. In this regard, I invite you to reread article 10 of this series, which deals with harmonic rhythm. The suspension develops according to a very precise rhythmic scheme, which commonly consists in starting the suspension on the downbeat (or a stressed beat) and resolving it on an off-beat. In the two previous examples the suspension starts on the first beat (downbeat) of the second bar and resolves on the third beat (off-beat) of the same bar.